Better Balance Begins in the Pool. Unfortunately, fear drives many of our actions. People often limit their potential because they are afraid they won’t be good enough. Or they wonder what people might think. Or maybe they’re afraid of getting hurt. Let’s talk for a minute about body and movement limitations. A previous fall, injury or surgery, combined with natural aging factors, contribute to fear of falling. Do you look down when you’re walking in unknown territory? Do you shuffle your feet to steady yourself with every step? The body looks for way to protect and prevent injury. Who can blame the body for that? The problem is that balance issues won’t get better if you don’t work on your balance. The good news? There is a safe and effective place to practice. You can crush your fear of falling by taking your balance program from dry land to the pool. 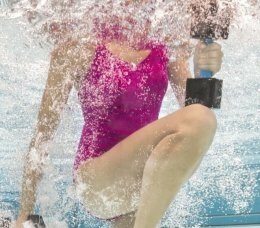 Buoyancy and resistance make water a highly desirable place to train and improve balance. Water hugs your body, supports weak muscles and helps you stand upright, steady on your feet. Even non-swimmers can feel comfort standing in shallow water and holding the pool edge or pool noodle for support. When the body feels a sense of safety, the mind and muscles begin to relax. The body is free to move in a range that might feel too risky on land. This ability to move in a bigger range allows the muscles to gain the flexibility they need for better balance. To improve your balance, you need adequate mobility. The muscles require the ability to wiggle and stretch to gather information about where joints are in relationship to one another. Are you ready? It’s time to stop standing around and hoping to beat your record for a one leg stand. Start stretching your legs in natural ways and you’ll be on the fast track to crushing your fear of falling. One of my favorite pool exercises is a 6-directional single-leg balance reach. Each joint in the body has multi-dimensional capabilities, which is why my training uses a unique, 6-directional movement formula. This gives the body comfortable, pain-free movement in all natural directions — forward, backward, right, left, turn right and turn left. I like to think of it as: Front to back, right to left and right and left rotation. Try it on land or in the pool: 6-directional single leg balance reach. Moving in a range that feels good, stand on one foot and reach the other, front to back. To steady yourself reach the hands in the direction opposite to the moving leg. Soften the knee and sink into the hips. Feel the gentle stretch on the standing leg. Repeat 3 to 5 times on both sides of the body. As you do the single leg balance, reach keep the standing knee soft and feel the movement at the hip and ankles. If you notice any pain or discomfort at the knee, make the move smaller and gradually increase the range. Always seek to find the range that feels best. The body will thrive in an environment where it feels safe and successful. Stay tuned in a few weeks for part two of balance training, where I’ll explain why having the ability to control motion is key to being able to stand on one leg for a longer duration.